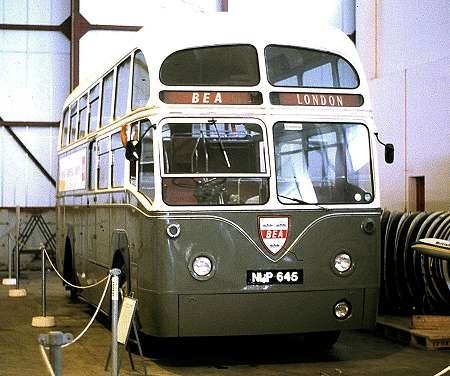 NLP 645 is an AEC Regal IV 9822E with Park Royal bodywork, new to BEA in 1953. The bodywork is described in different sources as HDC or RDC. The 2012 PSVC listing has her as RDP37C, which is a bit different! We see her during one of the infuriatingly rare open days at the Science Museum Annex, Wroughton, on 12 July 1986. RDP37C is the correct code – these were essentially observation coaches, but with a continuous roof-line and poorer quality "DP" style seats and interior trim. The "HD" code applied to Crellin-Duplex "half-deckers" such as the prototype which can be found on the "Ugly Bus" part of this website. BLOTW. Under more shows 3 photos in Everyone’s photos of NLP 645 being with BEA until 1966-67 1 of the 3 photos shows coach went to the London perfume and soap house Yardleys whom were then based in Basildon Essex. NPL 641 also went to them they are seen as a pair in first of the 3 photos. It is later seen in preservation. 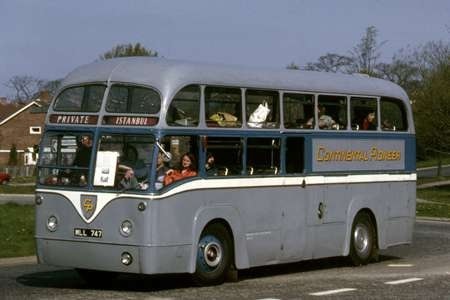 Manchester’s Burlingham bodied airport vehicles were always classified as "RC" by the PSV Circle, even though the level of comfort and trim was almost identical to the "RDP" London machines. I don’t think that there was any hard and fast policy- the use of the DP prefix was left to the discretion of the individual editor in the PSV Circle chain. In the case of North Western, for example, somebody at the Circle decided that the Weymann and Willowbrook 30′ DPs (the "Black Tops") were DPs despite their relatively bus-like seating and seat-pitch. The Alexander bodied 30′ Reliances of 1961 on the other hand were often described as "C41F", even though they consisted of coach interiors in a bus shell. Later in their lives (when repainted half-and-half) they were sometimes described as DP41F even though nothing had changed except their livery. I’m always very careful when I use a "DP" prefix- it’s essentially meaningless unless you go on to specify the exact configuration. The contract to run and maintain the BEA transfer coaches between central London and the surrounding airports was held by London Transport. When the Commer Commando 18 seater observation coach fleet became due for replacement, LT convinced BEA to adopt a variant of its standard RF Regal IV saloon, albeit with a Park Royal rather than a Metro-Cammell body. The new fleet began arriving from 1952, and was classified 4RF4 by LT. In their earlier years, they saw sporadic use, some being stored in the winter months, but as air travel became more and more popular, so the BEA fleet saw increasingly heavier service. They soldiered on reliably until 1966/7 when they were replaced by front entrance Routemasters with luggage trailers. MLL 747, one of the 1953 deliveries, was withdrawn in 1967 and passed to Continental Pioneer, in whose ownership it is seen here on the A23 at Southgate, Crawley during the May 1970 HCVC Brighton Run. In May 1972 it was sold to Scout Groups in Brighton and Hove, and its subsequent fate is unclear. Although Roger mentions The vehicles running from Central London, the BEA ones, at least, ran from the West London Air Terminal in Kensington, to Heathrow. Here’s a link to an item about it: https://rbkclocalstudies. The item mentions that, coming in, you could go to Central London, via the Terminal and presumably, you could pick up the vehicles in Cnetral London, too, but where? Did the vehicles and terminal also deal with BOAC? Chris, as you may have found out, Ian’s Bus stop is pretty good at summarising the 4RF4 operations. The WLAT I think was only BEA – then BA per the K&C local studies link. BOAC used their own Leyland Atlanteans from the Victoria Air Terminal (now the National Audit Office) which I think were garaged in the Heathrow area. To add a little to your second paragraph, Ian, the Victoria Air Terminal could well be that which was used before the war, serving the same purpose for Croydon Airport. The present National Audit Office was originally the Imperial Airways London Terminal, opened in 1939 to serve Croydon Airport. The war then intervened, and, with the resumption of peace, Heathrow became the airport for London, and BOAC the major carrier beyond Europe. Thx for confirming my thoughts, Roger. It must have been almost the last flourish of Art Deco architecture and duly awarded the name of the Empire Air Terminal. My favourite is the Daily Express building in Manchester, renovated not many years ago and truly beautiful, not a word I use lightly!